A young Ian McGeechan made his senior representative debut playing fly-half for Yorkshire against South of Scotland at Melrose. 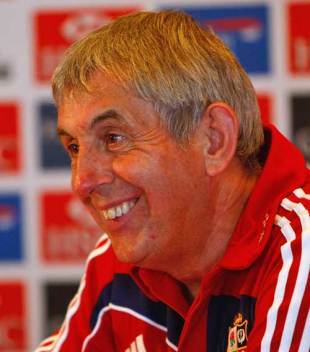 McGeechan starred for Scotland and the British & Irish Lions as a player before carving out an impressive career as a coach most notably with the British & Irish Lions. During a distinguished playing career he played 32 times for Scotland, nine as captain, and toured with the Lions in 1974 and 1977. After a knee injury ended his playing career aged 33, he went on to coach Scotland to a Five Nations Grand Slam in 1990 and also worked with the Lions on five occasions in 1989, 1993, 1997, 2005 and 2009 - steering them to victory over the Wallabies in 1989 and the Springboks in 1997. Leinster lost at home in the Magners League for the first time in almost two years as Llanelli Scarlets ran out emphatic winners at the RDS Showgrounds. The Leinster defence fell asleep for a crucial period coming up to the hour mark and the Scarlets seized their chance, running in four tries in the space of 11 minutes to canter clear. The game had been tight up to then, with Phil Davies' men taking a 16-11 advantage into the interval. But quickfire tries from captain James Bater, back row colleague Jonathan Edwards (two) and Kiwi centre Regan King left Leinster's bid to equal Cardiff's league record of 16 successive home wins in tatters. Despite losing flanker Brian Holt to a red card after he kicked Leicester's David Forfar, Coventry beat Leicester 13-3 but Holt was later handed a four-week ban for his moment of madness. On the same day at Franklin Gardens, two wrights made a wrong when Northampton's Geoffrey Wright and London Scottish's Ron Wright were both sent off after a mass brawl … but another Wright, Northamptonshire's Ian, kicked the winning penalty in his side's 13-12 win. The late Ivan Francescato sparked a bright Italian performance with a try in their 30-9 defeat of the United States in their Rugby World Cup pool clash at Otley. Stefano Barba, Fabio Gaetaniello and Paolo Vaccari scored Italy's other tries while the boot of fly-half Diego Dominguez weighed in with 16 points. St Thomas's cancelled their match with Guy's when they were unable to field a side owing to heavy overnight bombing of their Hospital. A Canadian representative party arrived at London Airport to undertake their first British tour for 60 years. The touring party was heavily dominated by players from British Columbia, and they earned a creditable 3-3 draw with the Barbarians on November 17. Former Wales captain Rees Stephens was forced to resign after a successful stint on the Welsh Rugby Union selection committee owing to ill-health. Jack Young took his place.